It is undeniable that the new technological connected world has brought to the collapse the past idea of relation, politics, education, art and somehow given voice and shape to a very long gallery of people who would have barely seen the light before: scarcely educated, rude, arrogant, tasteless, they flood the world with their superficial, trivial, sometimes violent but incredibly effective messages. As barbarians they implacably destroy our certainties and nothing seems it can be done but walking hopelessly among those ruins of the past. The point is: are these barbarians ruthless destroyers or maybe is this only the way we perceive and fear change ? After all, whatever cannot be fully understood is often seen as a threat. Am I just growing old and losing touch with the new? Maybe, we should just modulate the way we look at things rather than feeling continuously under attack. This is what suggests Alessandro Baricco, Italian novelist and essayist, for whom the barbarians represent innovation rather than violence and destruction. In his ” The Barbarians: an essay on the mutation of culture“, Baricco remarks that the beginners of a new era have always been considered barbarians by their contemporaries, because they smashed past tradition. What they had in common was a good degree of that foolishness so dear to Steve Jobs: the clear perception of change. In the past Diderot and D’Alembert must have seemed barbarians at the eyes of the intellectual elite of the ancient regime, let alone the revolutionary music of Mozart and Romantic poetry, of course, which in fell swoop destroyed all the canons of classicism.The use of simple, unelaborated language, common themes, blank verse, for the purist of the age was a barbaric act on classic form. Actually, I myself have often thought while reading Wordsworth‘s “Daffodils”, for example: “uhm , so puerile” and quite annoying all that flood of synonyms of the word “happy” (bliss, joy, jocund…) as if that were the only way to communicate the reader how happy he felt, but rather, resulting in my mind as a sort of Pharrell William walking in that wood singing and dancing wildly “because I’m happy“. And pray, don’t be offended by the word “puerile”, I borrowed it from Shelley‘s comment on the poem. All these people had to vandalize past canons to let their genius explode. You wouldn’t believe it, but even Beethoven was considered a barbarian for his age. The critic of the Quarterly Musical Magazine and Review used the following words to review his most celebrated ninth symphony in 1825: “Elegance, purity and measures, which were the principles of our art, have gradually surrendered to the new style, frivolous and affected, that these days of superficial talent have adopted. Brains that, for education and habit, cannot think of anything else but clothes, fashion, gossip, reading novels and moral dissipation, are struggling to experience the more elaborate and less febrile pleasures of science and art. Beethoven writes for those brains, and in this he seems to have some success, if I have to believe the praise that, on all sides, I bloom for his latest work.” And even the American reviews did not spare negative comments:”…very much like Yankee Doodle,” sniffed a Providence, R.I. newspaper in 1868 and “Unspeakable cheapness,” declared Boston’s Musical Record in 1899. Hence; Beethoven was only endowed with a superficial talent for them and treated like a pop musician. Baricco says that nowadays modern Barbarians are people like Larry Page and Sergey Brin who were only twenty when they invented Google and had never read Flaubert,of course; Steve Jobs, creator of the Apple world and that touch technology which is so typically childlike; or Jimmy Wales the founder of Wikipedia, the online encyclopedia that has formalized the primacy of speed over accuracy. These people sincerely did not reject all the past, yet, at the time of designing the future rather than using the tools of tradition, they employed new standards with the side effect of destroying to the root, entire estates of knowledge and sensitivity that lie in a shared heritage of civilization. So far, then, I understand that this sense discomfort that pervades me depends only on my inability of accepting the mutation of this age, as, put it in this way, the barbarians seem to be absolutely necessary for the evolution of our civilization to the same degree they accomplish the precious function of fuelling with young blood and energy the world of ideas. But then, Baricco introduces a new category and everything becomes more clear to me. The presence of the barbarians has a physiological consequence: the growth of the numbers of the barbarized. This phenomenon has always occurred, but in an age of mass communication where everything happens so rapidly, the barbarized may eventually prevail and change the course of events, before the revolutions of the barbarians might be effectively rooted in society. Furthemore, differently from other ages, the barbarized are no longer hidden and victim of the contempt of the refined, but they are fiercely visible on tv, social media etc., some of them has even pursued a career in politics. Hence, is this what the new world is going to be like? A world in the hand of the barbarized? There is one aspect I really loved about the Romantics of the first generation. They had a vision. They soon understood that the world was undergoing such a change due to the industrial revolution, whose consequences wouldn’t have been only of a social, economical nature, but emotional. Modern world would have moved faster, but speed would have made man inevitably more shallow if not blind. You cannot grasp the essence and the beauty of live if you must move at high-speed. For example, If I live in Rome and I want to go to Milan by airplane I will see just the destination, if I get the train I will be able to see the beautiful landscapes, mountains, rivers ; but if I could do it riding a bike I could smell the air, meet the people, taste their food, interact, live, I could really see, learn, grow – I am sure two fellow bloggers from Canada cannot but agree with me upon this point 😉 – . If you don’t want modernity to devour your uniqueness and sensibility, you need time and maybe a bike. Therefore you have to STOP. This is what Wordsworth said. Stop and breathe, stop and enjoy the wonders of nature, stop and make your “inner eye” live and vibrate with the spiritual forces of the world. If you just stop for a while, you will find happiness. 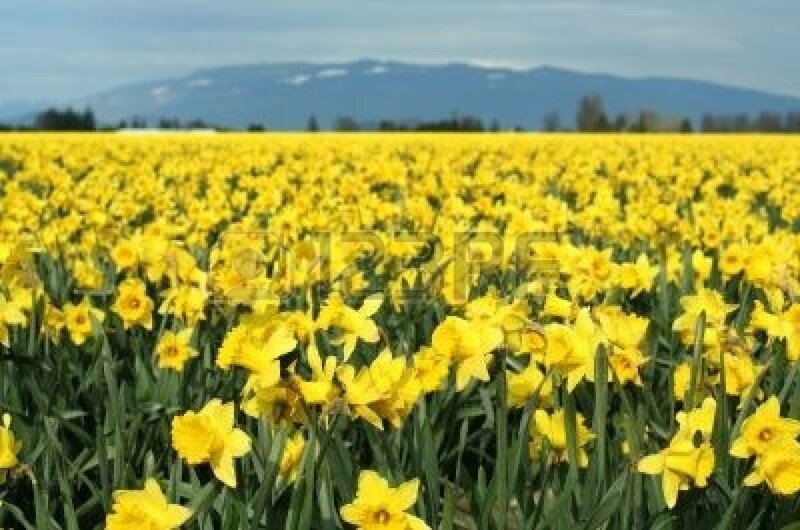 This is the inner message of one or Wordsworth’s most famous poems: “Daffodils“. He also adds, that this or any other experience of this kind, will be always part of man and helps him in times of trouble. But if a man is insensitive, where can he find his comfort? Even the Ancient Mariner of Coleridge‘s “Rime” stops with a spell the young, reluctant, Wedding Guest in order to communicate with him. 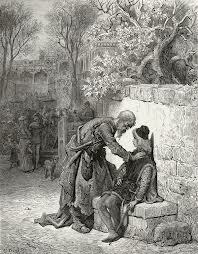 He wants the boy to listen to his tale in order to meditate upon its meaning. Think before acting or you will inevitably pay its consequences, he seems to say, take your time to do the right thing. In the end the Wedding Guest will be transformed into ” A wiser and sadder man”. At this point a question takes shape in my mind : “couldn’t Coleridge and Wordsworth be a kind of unaware Buddhists”? 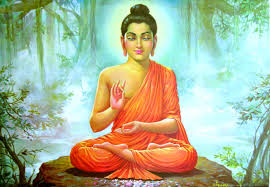 After all, the ancient mariner seems a sort of Buddha to me, that is, the enlightened teacher who shares his insights to help man (the Wedding Guest), end sufferings through the elimination of ignorance by way of understanding and the elimination of craving. Even the poem Daffodils, cannot be a great example of Buddhist meditation? 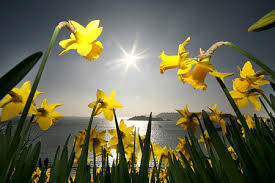 Your mind focuses on an object (daffodils), this image expands to your mind, body and entire surroundings, till your mind is able to gain insight (inward eye) into the ultimate nature of reality and reach a sense of beatitude (“My heart with pleasure fills and dances with the daffodils“). In that state, time does not exist and we are in harmony with ourselves reaching our Nirvana. However, Buddhism was well-known at those times. 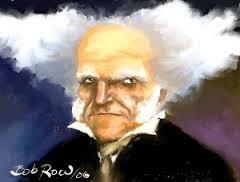 Arthur Schopenhauer, for instance, was deeply influenced by Eastern philosophy and religion and was convinced that suffering was caused by desire and only the extinction of desire led to liberation. 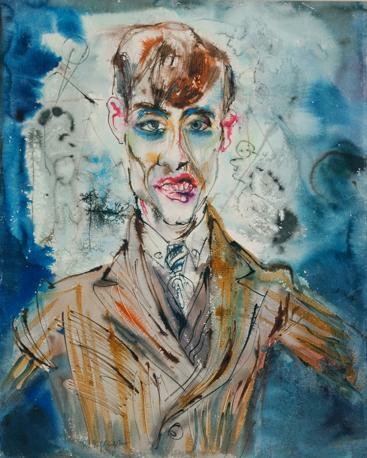 In The World as Will and Representation he finds in aesthetic contemplation a temporary way to escape this pain, because through aesthetic contemplation the world is no longer seen as an object of perception but rather as that place where one merges with that perception. In that timeless moment the individual loses his identity/will and his sorrows as well, thus being able to enjoy the true essence of the world. Ahhhh, that would be really great, but, excuse me…………….what time is it? I have to confess that this post has been inspired by the triumph of my football team just yesterday and by the “spontaneous overflow of powerful feelings” that I felt when my heroes scored three amazing goals that marked the success of S.S.Lazio. Yes It was powerful. So I can’t help but wonder how Klose…ooopsss,close ,I mean, football is to some ideas that Wordsworth developed in the Preface to the Lyrical Ballads. I know that It could sound blasphemous, but try to follow me. What is imagination? In simple words it is that degree of sensibility that allows you to turn whatever is ordinary into extraordinary. 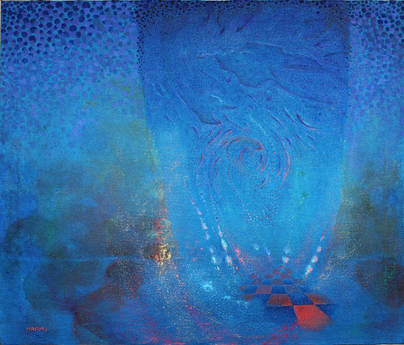 The consequent emotion is “powerful”, because unexpected. I’m sure that Wordsworth had chosen nature as source of emotion, because he didn’t actually know what football was. If we look at football with “ordinary”eyes , it is only a game about 22 adult males following a ball for at least one hour and a half. So,what makes it so extraordinary? Why today I feel totally ecstatic and why many others – many among my beloved students I guess – are bitterly disappointed? Probably because football somehow succeeds in keeping us in that “state of innocence and wonder” typical of children, that is , when our mind is more responsive to feelings. So we are more open to joy or sufferance. Furthermore every action of the game acquires an “extraordinary” meaning because the supporter not only shares his emotions with a multitude people but also in that action, goal or penalty he is the proud witness of a meaningful moment in the history of the club. That history is lived again and discussed every hour of every day on local radios, so thanks to this act of constant memory “our heart with pleasure fills and dances with……..” uhmm, I can’t find an appropriate rhyme, but I’ m sure you will understand me, won’t you?